What is Good: Wordless Wednesday - A ride on "Rosie"
Wordless Wednesday - A ride on "Rosie"
Dustin's dad built this Model T car some time ago and brought it out and took the family for rides, they call her Rosie. All the boys (big and small) loved it! 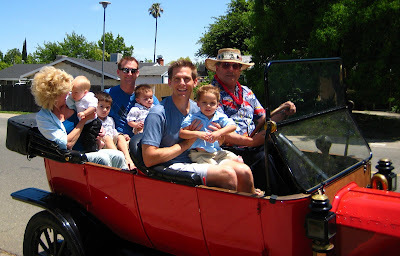 Here he is with Dustin & Alex in the front seat, Elliott is sandwiched between Jeremy & Emmett and Grandma & Isaac in the back seat. That is a fabulous picture...haha...love it!! They all look like they're having a great ride! Looks like fun! What a great job he did on the car! oh my gosh how cool!! What a great picture! Happy WW! How fun!! What a treat for everyone!!! Wow! It can accomodate so many passengers. Have fun! Someone built that? WOW. That is impressive. What a neat car and what a neat family photo. What a neat project. I bet the "boys" enjoyed the ride! Looks like a lot of fun. I love old cars. Looks like everybody's having a good time!